In the new media world, five companies are crushing everyone else. 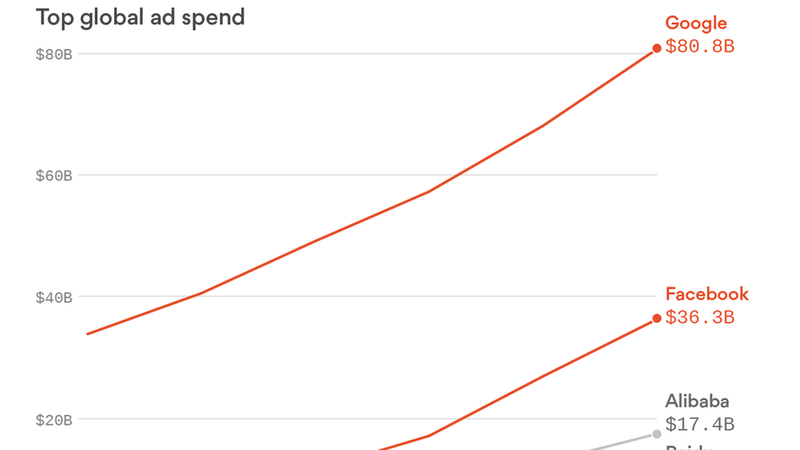 This year, two-thirds of all global ad dollars will go to the Big Five: Google, Facebook, Tencent, Baidu and Alibaba, according to the latest PriceWaterhouseCooper's Entertainment and Media Global Outlook. Roughly 50% percent of ad dollars flow to to Google and Facebook, America's "Duopoly." Together they are expected to take 83% of every new ad dollar, according to calculations from Digital Content Next, the premium publishers association. Three companies in China — Alibaba, Baidu and Tencent — control over 60% of the Chinese ad market and now account for 15% of all global advertising. Google's ad revenue has almost caught up to all print ad revenue globally and Facebook's ad revenue is quickly approaching all radio ad revenue globally. The 12 companies behind the Big Five — Yahoo!, Microsoft, Linkedin, IAC, Verizon, Amazon, Pandora, Twitter, Yelp, Snapchat, Sina and Sohu — bring in roughly half of what Google brings in annually in ad revenue. Why it matters: The absence of regulation to curb the dominance of some of these tech giants has forever changed how people consume news AND ads, and the strong keep getting stronger. Some Trump White House officials such as Steve Bannon fantasize about clamping down on the tech darlings but we see no signs they will act anytime soon. In Europe, the tech titans don't have it so good: European regulators — whose countries have lost the game of tech, pipes and content — are getting aggressive in trying to constrain the behemoths. The latest: European antitrust officials slapped Google with a massive $2.7 billion fine on Tuesday for abusing its search practices ––more than double what was expected. In a statement, competition regulators say Google has abused its market dominance as a search engine to steer customers to its own Google Shopping platform. The company has 90 days to pay up or will face penalty payments of up to 5% of the average daily worldwide turnover of Alphabet (Google's parent company). Why it matters: The decision will undoubtedly strain tensions between Europe and Silicon Valley. The Europeans don't share America's romantic view of Google, Facebook and other tech giants and are aggressively trying to highlight and restrain their market dominance, a move some White House officials such as Steve Bannon are watching closely as they debate future U.S. action. European regulators also introduced General Data Protection Regulation (GDPR) last year, a law that will put major restraints on how these companies can use consumer data to sell ads beginning in 2018. The bigger picture: European countries have great access to broadband but they use much less social media. Per Pew, only 37% of Germans use social media but 86% have internet access. The point: This anti-tech attitude stems from cultural trends favoring privacy, not just fiery regulators. Fun Fact: Drudge drives more traffic to news sites than all but five companies in the world — and MORE than Google News. Leftwing resistance growing: Several liberal groups most people never heard of are surging on Facebook: The Other 98%, Occupy Democrats, Proud Liberals, News and Guts. They are often early indicators of growing protests and pull Democrats to the left with a mix of emotion and movement. The advertiser conundrum: There is a growing trend of advertisers being caught in the crosshairs of partisan media forces, and that pressure is particularly strong from liberal activists. Advertisers fled Breitbart, Hannity and O'Reilly in droves when faced with left-wing pressure, and most recently, a few boycotted Megyn Kelly's Sunday night interview with Infowars leader Alex Jones. Expect this trend to intensify on both sides. The lesson learned? "Brand safety is becoming just as, if not more important, than ROI (return on investment)," says Steve Passwaiter, VP at Kantar Media, an advertising measurement firm. "It used to be that a controversial interview was a good thing. Go for the big-name interview and take advantage of the numbers. But that's just not the case anymore." Get ready for the next big trend in how people make money off video: super short commercials. With publishers and platforms scrambling to make video work in our distracted world, Fox Network Group's advertising chief Joe Marshese announced at Cannes last week the company would be joining YouTube in reducing commercial length to 6 seconds from the traditional 30-second spot. Why it matters: The next big media war is not just for share of an overall audience but for the share of each person's attention. Watch for an explosion of shorter solutions for mobile video. For the record, this idea isn't totally new: Snapchat unveiled its 10-second ad format for its video content platform, Discover, over two years ago. Podcasts, once a curiosity, now are big business: An industry forecast says they'll draw $220 million in ads this year. A new Interactive Advertising Bureau study also found that while three-quarters of podcast ads are direct-response (like ordering on Stamps.com), there's been an increase in brand-awareness ads. These are the ads you typically see aligned next to high-quality TV/video content. How it happened: The growth reflects an audio streaming boom, made possible largely through mobile apps like Apple Music and Spotify. The audience: Edison Research and Triton Digital estimates 98 million U.S. adults listen to podcasts. For kicks: Consumers prefer host-read ads over pre-produced ads 60%-40%, according to the study. Screamers: Screamers are apps that place voice level controls on games in which the speed of a player's run is controlled via the volume of the player's voice. In May, there were 94 screamers in Apple's App Store. Apptopia's Adam Blacker calls it the first "weird fad" of 2017. Fidget Spinners: The virtual versions of these mind-thumbing gadgets are exploding on Apple and Google, with 118 different ones in app stores now. Chat fiction apps: These apps are hot among teens for telling fictional stories through text messages. On any given day, Hooked and Yarn, two of the most popular chat fiction apps, both rank ahead of Amazon's Kindle and Amazon's Audible in the store books category in the Apple app store.